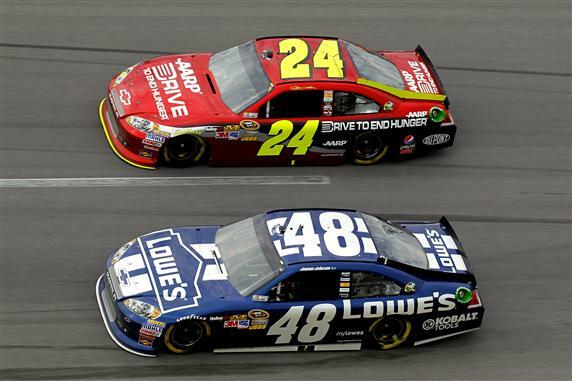 Hendrick Motorsports and Talladega have a love-hate relationship. 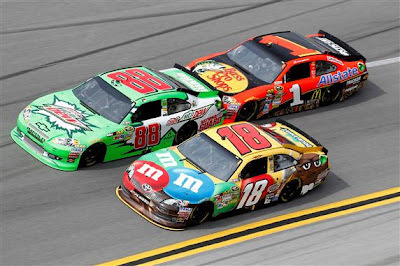 In 186 starts at the 2.66 mile track, HMS drivers scored 11 victories: Ken Schrader, Terry Labonte, and Brian Vickers with one each, Jimmie Johnson with two, and Jeff Gordon with six. Dale Earnhart Jr.'s trophy case contains plenty of hardware from 'Dega but none of those wins were with his current team. But they've also racked up 56 DNFs. With the championship hopes of four drivers hanging in the balance, which would it be in the Good Sam 500? Love or hate? The weekend started on a high note for Kasey Kahne with his third pole of the season. 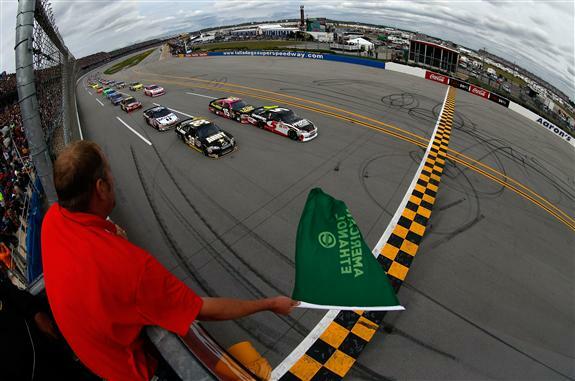 While starting position may not affect finishing spot as much at Talladega as at other tracks, pit stall choice matters. Starting from the pole gave Kahne hopes of not being involved in an early wreck. Mission accomplished on that front, but running out of fuel on Lap 100 put him back in the pack for much of the rest of the race. By staying out on a late caution Kahne made it to the top 10 on the last restart. When the last-lap crash began, the Hendrickcars.com Chevy had teammate Jeff Gordon on his bumper. Gordon slipped through, but Kahne got caught up in the melee. "You are kind of along for the ride once it starts, but I just about made it by and somebody got me I think in the right rear corner and turned me back to the right and sucked me up into it." Kahne said. "I felt like I could downshift and try to steer it as long as I could. We ended up making it back to the line; a few cars passed us so we might be a little better than 13th." When the smoke cleared, Kahne was scored in 12th and moved up one spot to fourth in the championship standings. Some analysts were holding off until after Talladega to "put a fork" in Jeff Gordon's chances of winning his fifth championship. Now it's apparent why. Had that last-lap pile-up happened earlier in the race, perhaps Gordon would have gained more points on the leaders to go along with the four positions he gained in the points standings. With his second-place finish, he jumped from tenth to sixth, but remains 42 points behind leader Keselowski, despite finishing second or third in six of the last seven races. But at the end you know it's going to get aggressive. It started to ramp up, so you're pretty sure there's going to be a caution, and then with the green-white-checker, you know you're not making it back to the checkered. You wonder if you'll make it to the white. You know you're not going to make it back to the checkered without there being a wreck." When asked if he agreed with Earnhardt Jr.'s distaste for the style of racing featured Sunday, Gordon said. "I remember when come Talladega was fun. I really do, and I haven't experienced that in a long, long time. I don't like coming here. I don't like the type of racing that I have to do. But if I'm a fan, I would love that. I think it is incredibly intense. It's wild. It's crazy. You're going to see it. Sometimes that balance that NASCAR has to deal with doesn't mean ‑‑ I mean, I don't have to be happy and be all excited about coming to Talladega. I don't expect that. But I do remember times when the draft and the thought that you had to put into it, the strategy working the draft and the cars in the lines was fun. You had some room in between the cars, and you had to use the air instead of the bumper. To me you could still come from the middle of the pack to first on the closing laps, but just how you did it was different, and it certainly wasn't what - I mean, that literally is bumper cars at almost 200 miles per hour, and I don't know anybody that likes that." Perhaps one of the only amusing sights to emerge out of the epic pileup on the final lap of the Good Sam Roadside Assistance 500 came when Jimmie Johnson, his No. 48 Lowe's Chevy sitting immobile, hitched a ride back to pit road by climbing in the window of teammate Dale Earnhardt Jr.'s car a la Rick Hendrick on the night of HMS's 200th Cup win. Johnson and crew chief Chad Knaus planned to stay in the back through the early part of the race, which they did, managing to stay clear of any trouble. Knaus let loose of the reins on Lap 115 and Johnson began moving to the front while trying still trying to conserve fuel. When caution came out for the Lap 188 spin of the No. 1 car, Knaus brought Johnson in for a splash of fuel, but the strategy was wasted when the No. 48 got tagged in the last lap fray. "We knew it was going to happen. We did a very good job of managing things all day long. It was just getting really tight." Johnson explained. "I think we were probably four-wide going into (Turn) 3. I could see some tire smoke off the guys in front of me, and then everybody just merged together and we were all in a big wad at that point. Fortunately my car I could still drive to the finish so I passed a couple of guys that were sitting there on the bottom trying to get going themselves. I guess I finished 17th. I don't know, we'll take it I guess. We don't have a choice now." The 17th-place finish kept Johnson within 14 points of leader Brad Keselowski as we head to Charlotte, where Johnson has six wins in 22 starts. Things could get interesting at the top of the chart. Earnhardt and Talladega. They just go together. With the season Earnhardt Jr.'s had, he hoped to reclaim his status as the heir apparent to the title of Pied Piper of 'Dega and bring joy to the ranks of Junior Nation. When the bright-green No. 88 took the lead on Lap 13, the crowd thundered. With a fast car, he could move to the front and it looked as if he might be able go to Victory Lane at 'Dega for HMS. Unfortunately, Earnhardt was too fast exiting pit road on Lap 61's green-flag pit stop and the subsequent pass-through penalty put him back in the pack, with no one particularly eager to help him get back to the front. Fortunately they were at Talladega, not Dover, and the car was fast enough to get the lap back the old-fashioned way...by driving to the front and staying there until a debris caution came out at just the right time to allow Earnhardt Jr. the opportunity to get back around. Crew chief Steve Letarte worked some of his pit strategy magic, and with a little luck the No. 88 would be good to the end. But it was not to be. Tony Stewart, the driver who pushed Earnhardt Jr. to his first Cup win at the Alabama track, made a split-second decision that put the No. 88 in a squeeze from all four sides. With a 20th-place finish, Earnhardt Jr. slipped to 11th place and his championship hopes crashed along with the car. He told Letarte, "I don't think I can take any more hits like that." After the race, visibly shaken, Earnhardt Jr. said, “If this is what we did every week I wouldn't be doing it, I will just put it to you like that. If this is how we raced every week I would find another job.” When asked what changes he'd like to see, he said, “The way we are going ain't the right direction. There are plenty of engineers out there I’m just a driver. There are plenty of smart people out there that can figure something out where when one guy gets in trouble we don’t have 30 cars tore up at the expense of it." Remember, this is an Earnhardt saying this. He continued, "I mean it’s awesome in a word and everybody can get on the chip about it and get excited about all that which just happened, but for the longevity of the sport that ain't healthy. I don’t care what anybody says, for the good of the sport - I mean it’s good for the here and now and it will get people talking today - but for the long run that is not going to help the sport the way that race ended and the way the racing is. It’s not going to be productive for years to come.